This is the "original" and most popular WEBFoot public jig... the one that started the term "public jig" way back when. All of our jigs are made from tool steel and hardened to "Maximum hardness" (current batch came in at 63-64Rc) to resist steel and HSS cutting tools such as files, saw blades, etc. After heat treating, each jig is cut on a Wire EDM to avoid any movement of the material during heat treating and maintain the best accuracy possible. Obviously for a public jig, this might be more accurate than necessary - but if its worth doing, its worth doing right! These jigs CAN NOT be altered with standard steel/HSS tools. Need help choosing a jig? READ THIS! Cork Notch Height/depth: .165" (3/16" cork) / .350" deep. Suggested wedges/cork: 316dcc, 316HDC, 177SW, or use 162SW for double reed applications. Sand thickness for desired fit. Deck Height: Measured at the front of the cork notch ≈ 0.330 - 0.335"
Suggested Tone Channel Dia: 15/64" or 1/4"
Board Length: Back of cork to tip of jig: 1.720"
This is an PARALLEL design jig. For an Upslope design use PJ2. Please read this description entirely before you contact us with questions. "Upslope" means that the reed slopes upwards at the end - compared to the centerline of the keg. "Parallel" means the reed is parallel to the centerline of the keg. This jig is hardened and can not be altered with steel tools. Warranty void if altered or abused. D1 & D2 extra reeds (D1-R-15 or D2-R15) are NOT RECOMMENDED for use with the public jig as they are very narrow reeds, and the .014" reed is a little thick for use with a single reed AR style call. The public offering jig is a production version jig and each one is just like the other, it is not custom in any way other than when the jig was designed it was customized specifically for reproduction by Wade Carpenter. It is NOT perfect, nor does it have the same surface finish on the tone board that comes on the Custom Jigs. This is on purpose. The sound board this jig creates "straight off the jig" is marginal as some would say. Others have said its the best "public jig" out there, but it really is up to each individual as to what they think of the sound produced directly off the jig. The public jig is not meant to create a finished product, it is to help get beyond the initial shaping stages of the sound board to get to a point at which one can start learning to make their own soundboard. The public jig is not used to create any products sold here. If you are interested in the sound the public jig creates directly from the jig, it is suggested to post up on the various call making forums for opinions from the many users of this jig. We do not have any parts cut from this jig, nor sound files of a sound board from this jig since it is not intended for "final production" of sound boards. The public offering version is a good starting point for you to design your own soundboards. This jig is a learning tool, and not a jig designed to give a finished product. This jig will help you LEARN how to make calls, it will not make calls for you. There will be a light scribe line of both sides of the jig. This scribe line is a starting point for you to reference when locating the end of your tone channel. It is not a "set in stone" dimension, only a guide to help you get started. There are 2 tapped holes on the bottom of the jig. The intended purpose of these tapped holes (1/4-20 thread) is to allow adjustment of the keg tenon in the jig for experimenting. These take 1/4"-20 set screws (not included). 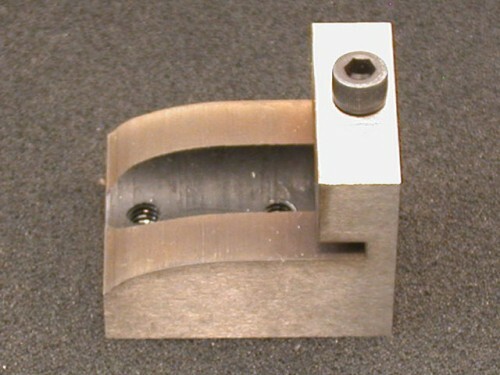 These holes allow you to thread a bolt or set screw through the bottom, and to gently push up on the insert in different spots, to adjust where your base line is - for example if you were wanting to make an upslope reed design from a parallel jig, you could thread in the bolt under the cork notch and push the back up just a little. There are two set screws included with the jig, a Steel socket head cap screw and a nylon socket head cap screw (can sometimes reduce the marring to the keg from the set screw). Remember, do not sand, grind, or use carbide tools on the jig unless you are purposefully trying to alter the shape. Jigs are designed to withstand normal steel cutting tools such as files and saws. Do not use a hammer on, drop, or abuse any hardened part or tool as it may fracture and cause injury. Remember, do not sand, grind, or use carbide tools on the jig unless you are purposefully trying to alter the shape. Jigs are designed to withstand normal steel cutting tools such as files and saws. Do not use a hammer on, drop, or otherwise abuse any hardened part or tool as it may fracture and cause injury. Jigs that are broken due to dropping, clamping in a vise too tightly, ground on, altered, or otherwise abused will NOT be covered by any warranty.